We got a lovely friendly email from Lucy at the London Oxfam office inviting us to their Artopia event on Tuesday 3rd August. Artopia was about creating a vision of a climate chaos free future using craft so of course we were super keen to go along! It was during the day so only 6 of us had the time to go but we loved it. We all arrived 3pm at the LEB building on Cambridge Heath Road in Bethnal Green. We were welcomed by smiling Oxfam staff and volunteers in their cool ‘Rebel with a Cause’ t-shirts (I really want one!!!) and hard-hitting information on how climate change is affecting the poorest people in the world right now (!) causing homelessness, drought, flooding, hunger and many more problems that we shouldn’t be allowed to ignore. We were shown to our seats surrounding a large table with paints, glue, scissors, fabric and all the other resources craftsters dream about (or maybe thats just me?!:s). We said hello to other members of the public there: from 3 cheeky local kids (aged 5 to 11 I’m guessing), their mother who kept admitting she wasn’t very creative whist her daughter was excited about using the green paint tube and promised to be careful she didnt get the paint on her pretty dress to an older lady who came on her own and looked canadian online pharmacy pain medication deep in thought about what her utopia shoebox would include. 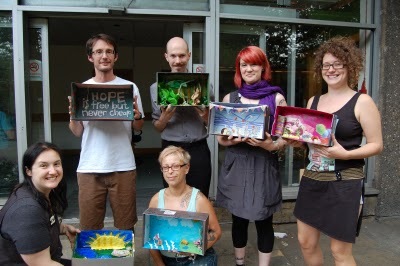 We checked out the wall of finished shoebox artopias for inspiration and then got to work. We stayed until 5pm when we were told to finish up so we could end with cheese and wine and a chat. It was a great excuse to sit around a table crafting but whilst feeling all warm and fuzzy inside that we were helping to spread awareness of the injustices of climate change on the world’s poorest people and the affect climate change is having now. We had some really interesting discussions about our persona utopia dreams, some upsetting conversations about the affect climate change is having on the poorest people in the world and some inspiring views on how we as individuals still have the power to make a positive difference in the world so we can’t just give up. Craftivist Neil said “Artopia was a brilliant chance to get stuck in with the other craftivists. We’ve all begun to think a bit more seriously about what we can do to help those most affected by the implications of climate change”. If you want to get involved in an Artopia, either as an interested individual, an artist or the leader of a community group please do get in touch with Lucy AitkenRead here.